If you're planning on taking off for the weekend on your motorcycle, do a little planning about what to take along with you. It will save you time, space, and probably some money! Women tend to have a more difficult time packing than men do, especially when you're on a motorcycle and there is limited space. For some reason, I find that just because I know I only have a small space to pack in, I suddenly have to bring things with me that I haven't needed in years! But a bit of careful, strategic planning can get you through an entire weekend. One thing that is essential in my weekend bag is a rain suit. I will not go on a long ride without it. I have a lightweight suit that folds up into a very slim pouch, so I pop that on the top of my bag when I've gotten everything else stowed away. It's definitely worth investing in a lightweight suit if you go on long rides on a regular basis. You may only need it once or twice, but you will be glad you have it! I want to have a few other things on hand as well when I ride. I always put a multi-tool in my bag, for those times rare times you might need a tool. I throw a small flashlight in as well. I make sure I either have a map with me or a GPS, and I make sure my cell phone is charged up. My cell phone has a GPS on it, so I can kill two birds with one stone with that one. I will typically pack one outfit for wearing during the day on the weekend, and one outfit for night. I ride with my boots on, so I pack one other pair of shoes. Sometimes I will pack an extra shirt, but I plan on riding back wearing the clothes I rode out in, just so I don't have to pack extra. I do always toss in an extra pair of socks, just in case. I put some pajamas in there and a toothbrush, and I am pretty set to go! 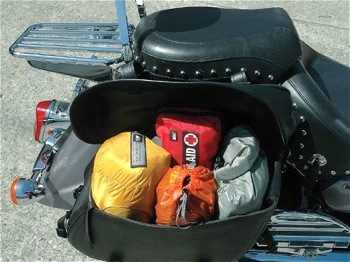 I also keep several things stored on my bike to help prepare me for emergencies. I never leave home without a fairly full roll of duct tape. Duct tape, I have found, can fix anything long enough to get you where you need to go. I also keep a stocked first aid kit, although it is small. I make sure it has fresh bandages, painkillers, and scissors and tweezers. I take a look at it every few months, to be sure that the medicines aren't out of date. I keep a bottle of water stored on the bike as well, just for emergency purposes. I do change out the water every few months if I don't drink it. I don't think water has a shelf life, but it begins to taste stale after awhile, which can't be a good sign. Last but not least, I don't leave home without my earplugs. I did spend some time finding some great fitting earplugs, after starting out with the cheap drugstore brand that didn't fit quite right. Finding a great fitting pair of earplugs can make a long distance ride much, much more pleasant!